For most people, the Museum’s Jonas More House, dating to 1818, is a visual wake-up call. Vivid interior colors take sudden turns from pinkish red to mustard to green; paint graining changes wildly from room to room; wallpaper patterns are bold; and the overall effect is audacious, to say the very least. Did the 1818 house really look like this when its first owner—Jonas More, a prosperous dairy farmer, mill owner, and businessman—lived in it? You bet, says Livermore. The early 19th century had a more vibrant sense of color and pattern than most people think. French wallpapers, reproduced for this house, include shimmering irisé or rainbow and meandering vine and paisley papers in yellow and lavender. 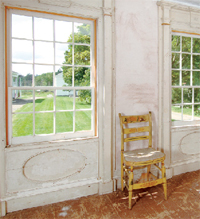 The Museum’s 10-year restoration, which focuses on the house as it was in the 1840s, was based on physical evidence found in the house and on historic documents. Restorers, including faculty and students from the renowned Cooperstown Graduate Program, used leading-edge techniques to determine original paint colors and graining treatments, which they replicated. 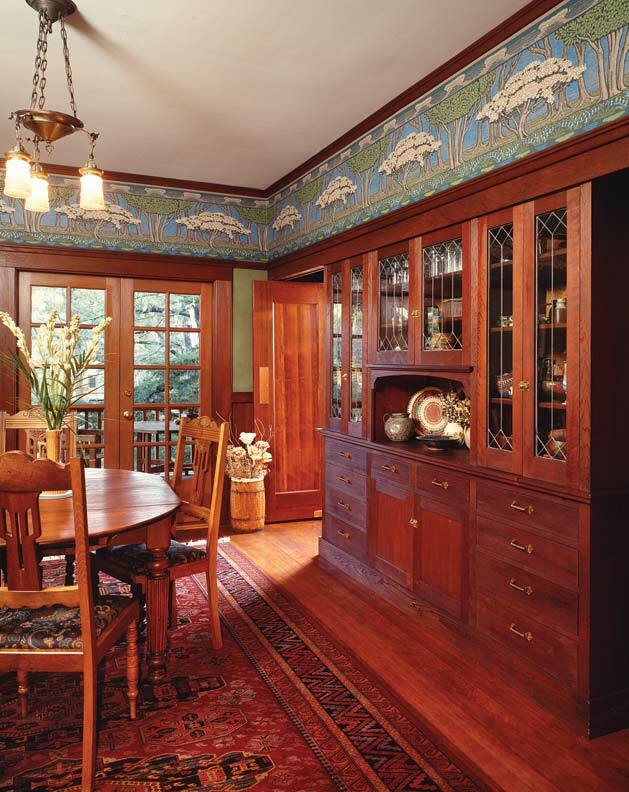 Finding no trace of the home’s original wallpapers or carpets, they took cues from decoration seen in period paintings, as well as other wealthy Delaware County homes during the period. In rebuilding the Jonas More house, workers reconstructed walls using hand-split wood lath and red Delaware County sand. 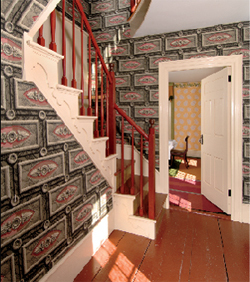 Striped Venetian carpets were made by Thistle Hill Weavers, while wallpapers were made at the Museum and by Adelphi Paper Hangings—whose founder, Christopher Ohrstrom and his wife Lilla, rescued the house, dismantled it, and donated it to the Farmers’ Museum. More family probate inventories provided clues for the furnishings, which include an heirloom dresser. In the 1820s, grain painting was a popular decorative device, sometimes refined in imitation of mahogany, other times bold, wild, and utterly fanciful. 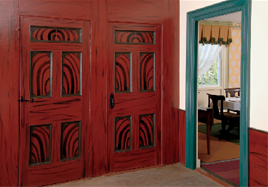 Red-and-black graining with turquoise woodwork? Wow! Why So Bright and Bold? Early-19th-century America was a prosperous time—industry burgeoned, agriculture thrived, and new railroads and canals carried consumer goods throughout the nation. Period paintings show how much Americans, buoyed by the optimism, combined colors and patterns to delight the eye. Priddy says, “For American artisans at home and in the workshop, the kaleidoscope became a seemingly endless source of designs for furnishings inspired by its array of colors and predictable geometric patterning. . . . a kaleidoscope gave viewers the sensation of being lowered into the midst of a prism.” Looking at the More House’s wallpapers and carpets, lively colors and exotic paint graining, isn’t that insight an eye-opener? 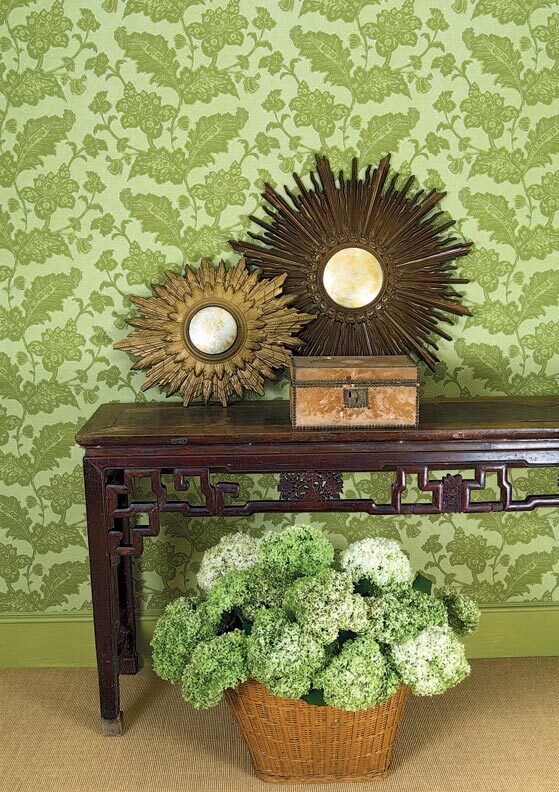 How to divide and decorate your walls for a period look.